I hope I shall be excused if I betray a certain feeling of paternal pride and joy while introducing Dr. Pierre-Sylvain Filliozat who delivered “The Professor K. V. Abhyaukar Memorial Lectures (Fourth Series)” at the Bhaudarkar Oriental Research institute, ou July 18—20, 1989, for, he is the talented son of my long-time friend and colleague, Professor Jean Filliozat. Pierre Filliozat may no longer be described merely as a coming ‘ Indologist; he is, if I may coin the phrase, already an Indologist who has ‘come’. Even at an early age (1963), he became a Member of the prestigious Ecole française d’Extrme-Orjont, Since 1967 he has been working as Director of Sanskrit Studies at the Ecole pratique des Hautes Etudes, 4th Section, in Sorboune. What, however, could be of immediate Interest to us is his annual assignment (each extending over nearly six months) at the French Institute of Punditry, India. There, be has succeeded in developing an active centre of Ideological Studies which specializes in, among other subjects, Sanskrit grammar said archaeology. The range of Pierre Filliozat’s publications Is quite impressive. I may just mention his editions of Vidynitha’s Prataparudrya and Nflk.ntba Dlksita’s works on poetics and his French translation of Patañjali’s Mahãbh,sya with Kaiyata’s Pradipa and Nãgea’s CdcIya (of which five volumes have been published so far). In coUaboration with his wife, Vasundhar, Pierre Filliozat has carried it archaeological investigations at Hampi-Vijayanagar and has iblisbed an interesting monograph on the Temple of Vithala situated there. His recent Grarnmtire saj’skrite pining. Penne will surely prove a very serviceable manual on the subject. Pierre Filliozat Is also a frequent contributor to research journals. Altogether he hail win full awareness of his filial obligation in the academic field, while releasing these lectures, for which the Bbandarkar Oriental Research Institute Is thankful to Pierre Filliozat, I wish him all success in his future research projects. 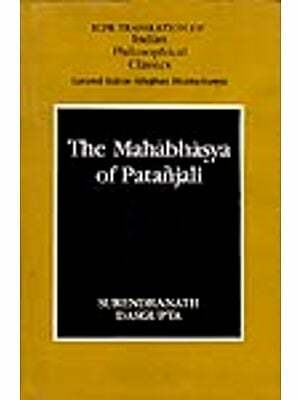 The critical edition of Commentaries on Patajall’s Mahäbhasya and Kalyata’s Pradipa, undertaken by Pandit M. S. Narasimhaoarya, has been one of the major achievements in the field of international Indology during the last three decades. In a series of liven volumes totalling more than 4,000 pages, the complete text of iunainbhatta’s Uddyotana and long fragments of five other commentaries have been published by him in the French Institute of Indology at Pondicherry. This is an addition to the earlier editions of the complete texts of Mahãbhásya itselt, of Pradipa, of Nãgea’s liddyota with a small fragment of Payaguta’s Chäyã, and finally of the fascinating portion of Bhartrhari’s Dipik, which all together reach also a total of some 4,000 pages. We know that other commentaries exist, that some manuscripts are still accessible, at present under study and waiting for publication. We keep the hope that more manuscripts of unpublished material in this domain will come to light one day. Moreover the literatures relevant to Mahãbhãsya dose not end with proper commentaries. There are also independent works such as Bhattojl Dikita’s abdakaustubha and tracts on particular sutras or subjects, which are subservient to Patañjali’s ideas. The large corpus of texts provides a help for the understanding of Mahäbhäsya, constitutes a most remarkable treasury of ideas and concepts of linguistics and represents the best and most difficult pro dictions of intellectual work in ancient and traditional India. ‘he present volume aims at introducing the reader to this literature. It emphasises a characteristic feature of the authors of these texts, viz, their mastery of intellect, coupled with renunciation and a leaning towards yoga. 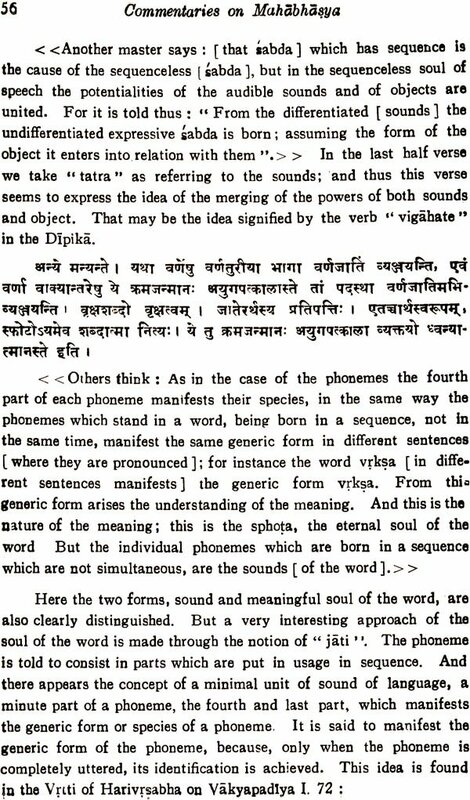 It presents all that has been told by the eight commentators from Bhartthari to Nagea on Patajali’s definition of abda, and that clearly shows that they were concerned not only with the task of elucidation of an ancient text, but also with the effort to Inquire In the reality of language, to improve The theological tools of interpretation and to achieve progress In an intellectual quest. The works of Bhartrhari, of• ivarãmendra Sarasvatr and of Nagea appear thus as important landmarks in the history of Vyikarana, of Sanskrit stras and of human mind. First I wish to acknowledge here my debt to Pandit M. S. Narasimhacarya who for many years explained to me long passages of these difficult texts, and gave me even more by showing me how an accomplished, orthodox, traditional pandit works and lives. I express my gratitude to Professor R. N. Dandekar who liberally gave me an opportunity to present this work at the Bhandarkar Oriental Research Institute in the form of three lectures on July 18—20, 1989. 1 was especially moved by the fact that these lectures were organise4 in memory of a great Vaiyàkaraia who did so much to improve the knowledge of Mahãbhãsya, Mahamahopadhyaya Kashinath Vasudev Abhyankar. Professor R. N. Dandekar, Professor S. D. Joshi and Professor Saroja Bhate did me the honour of presiding over the lectures, for which I thank them sincerely. I wish also to extend my hearty thanks to Pandit Venkataraja Sharma of the French Institute (Pondicherry) for reading the script and suggesting valuable corrections.